It is natural when the sun makes it’s comeback and the days start to get warmer and longer that we long for a bit of a ‘freshened’ hair shade. The sun naturally lightens hair and so the association with summer warmth and light locks is cemented in our collective psyche. But of all the various ways we change our shade, how many of them are harmful to our bodies? It’s estimated that 70% of women color their hair on a regular basis, not to mention men. Most salon lightening agents or at home products contain damaging ingredients, including formaldehyde, ammonia, bleach, and a dozen other unpronounceable chemicals! These chemicals are not only damaging to our bodies in general, but they actually destroy hair over the long-term by making it dry and brittle while burning the follicle that produces it. This then leads to a burst of hydrating and moisturizing products full of even more harmful chemicals that we pour onto ourselves. However, it’s normal to want to make changes to our appearance and most women report feeling more attractive when their hair color has been altered. So instead of throwing the baby out with the bathwater, let’s look at some natural ways to lighten hair that will look beautiful, feel wonderful, save money and protect our bodies. Exposure to the bright, warm rays of the sun is the simplest way to get lighter locks. But not everyone has the time to sit on a beach for hours on end just to get their look right. Instead, there are a variety of aids that help natural sunlight work even faster at lightening hair, so that a quick half hour can result in the same lightening as a full day. A salt spray lifts the cuticle of the hair and makes it more receptive to the lightening effects of UV rays. Salt is a great styling product already for hair, giving it that perfectly lifted, bouncy appearance. You can use a simple spray made with one tablespoon of salt dissolved in a cup of water, or you can go with a pre–made sea salt spray. Spritz the formula onto dry or damp hair with a spray bottle and then get out into the light! Your hair will lighten quickly, the same way it does after a day in the salty waves and ocean sunshine. Alternately, you can pour the whole cup over your hair to soak it and then let your hair air–dry. Once dry, rinse the salt back out. Repeat as necessary for a greater lightening effect. Baking soda is another great way to maximize the benefits of sunshine. A baking soda hair wash strips away any chemical or product residue, leaving your hair really, really clean and free from any build up that may be blocking your hair from the sun. It also has a lightening effect on its own, the same way it can whiten your teeth. Just make a paste with water and lather it into your hair the way you would shampoo. Let it sit for a few minutes and then wash it out. This effect is gradual but will lighten your hair over time and it’s a great cleanser to boot! Lemon is perhaps the most famous of the natural hair lightening options. The citric acid in lemon has bleaching properties and it can be used either on its own or to enhance the effects of sunlight. Use a cotton ball to apply lemon juice to streaks of hair, or dilute with water and apply all over. Either let the mixture sit for at least half an hour before rinsing, or let hair air–dry outside in the sunlight. You can also apply this just to the ends of your hair or with a cotton ball, starting from the ends and stroking upward toward the root, for a light, shaded effect. Oranges can be used as well for a similar effect with less of a brassy hue if your hair has reddish undertones. 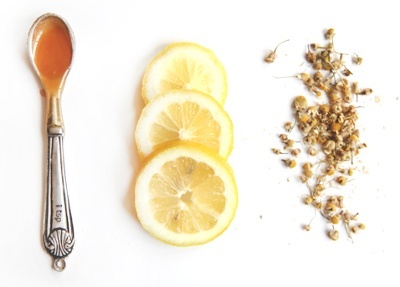 Chamomile is another old time favorite for natural hair lightening. Simply steep a couple of tea bags in hot water to make a really strong brew, then let it cool. Pour this cooled mixture through your hair several times as a rinse, catching the falling tea in a basin each time to reuse it. After several passes, let your hair air–dry naturally with the tea still in it. Once dry you can either leave it in that way or wash it out and style as usual. Honey has more than one amazing use for healthy, beautiful hair. Not only does it lighten, but it is a fantastic moisturizing conditioner as well. Honey actually has a trace amount of hydrogen peroxide that causes lightening, the same active ingredient as the commercial hair dyes at the salon, but in a much safer quantity. If the thought of putting sticky honey in your hair terrifies you, then don’t worry— it is actually a really nice hair mask because it stays put on your head and doesn’t run down your neck like other, less viscous hair masks do. And the honey easily washes out in the shower, not tangling or goo-ing up your hair at all. To apply, either warm up the honey to make it easier to work with, or mix with equal parts oil or vinegar. Honey is a great base to add other hair lightening ingredients to as well for an even more potent treatment. Massage it through your hair, combing with your fingers to evenly distribute the mixture. Wrap the mask with plastic wrap or a shower cap and let it sit in your hair for at least two hours, or overnight, and rinse it out in the morning. Several applications will have a noticeable effect on hair color and hair softness as well! Who knew cinnamon could lighten your hair color?! Turns out it can, and cardamom can too. Mix cinnamon and oil or honey, or your regular hair conditioner into a paste. Massage it through your hair until each strand is coated and cover it with plastic wrap or a shower cap. Let it sit for several hours, or preferably overnight. Rinse as usual when finished and repeat as often as necessary for the desired effect. Rhubarb has a reddish hue, but will actually make your hair more blonde if applied. To use rhubarb, chop up a large handful of the stalk and simmer it for ten minutes in two cups of water. Let the mixture sit and steep, like tea, for a few hours while it cools. You can even let it steep and cool overnight. When the mixture is cool, strain out the rhubarb and use the ‘tea’ the same way as the chamomile rinse. Finally, another useful, natural option is Vitamin C. You can find Vitamin C pills or Vitamin C powder in the supplement aisle of your grocery store or at a health food store. Crush 5-10 500 mg pills and add the powder to your regular amount of shampoo. Use as usual, rinse out and follow with the rest of your regular shower routine. Or, you can mix the powdered Vitamin C into your conditioner the same way as for the cinnamon mask and leave it on your hair for up to an hour before rinsing out. All of these options have been used successfully for years to naturally lighten hair, without the damaging effects of harsh chemical treatments. Try one or try them all, the more you use and the more often, the greater the effect will be. So ditch the winter blues! Look good, feel good, and have fun with it!